It’s a very special Christmas! It’s been 1 year since we launched on Steam! 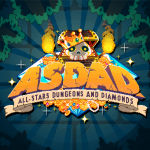 ASDAD Christmas Update is live! Holiday Update and New Guest Character: Winti! ASDAD Fundamental Secrets, Details and Facts! ASDAD has been officially released on Steam! New guest character: Ittle Dew! Dev Update! Upcoming content and surprises!